Step out of the city life by going to Oro and Archipelago National Park. Explore the numerous day-trip ideas around Kimito Island: Rosala (Rosala Viking Centre & Bengtskar Lighthouse). Discover how to plan a Kimito Island trip in just a few steps with Inspirock's itinerary builder. Bangkok, Thailand to Kimito Island is an approximately 18.5-hour flight. The time zone difference moving from Indochina Time (ICT) to Eastern European Time (EET) is minus 5 hours. Prepare for colder weather when traveling from Bangkok in July: high temperatures in Kimito Island hover around 25°C and lows are around 13°C. Finish up your sightseeing early on the 10th (Wed) so you can go by car to Naantali. 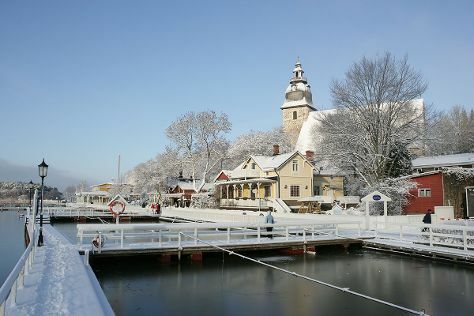 Naantali is a town in south-western Finland, known as one of the most important tourist centres of the country. Head to Turun Kauppahalli and Kauppakeskus Myllyfor plenty of shopping. Visiting The Archipelago Trail and Kurjenrahka National Park will get you outdoors. There's lots more to do: wander the streets of Naantali Old Town, kick back and relax at Ispoinen Beach and Sauna, see the interesting displays at Luostarinmaki Handicrafts Museum, and browse the collection at Turku City Library. For reviews, other places to visit, where to stay, and more tourist information, read Naantali route planner . Traveling by car from Kimito Island to Naantali takes 1.5 hours. Alternatively, you can take a bus. July in Naantali sees daily highs of 24°C and lows of 13°C at night. Cap off your sightseeing on the 15th (Mon) early enough to travel to Uusikaupunki. Step out of the city life by going to Isokari Lighthouse and Katanpaa. To see more things to do, where to stay, maps, and more tourist information, go to the Uusikaupunki trip planner . Traveling by car from Naantali to Uusikaupunki takes 1.5 hours. In July in Uusikaupunki, expect temperatures between 24°C during the day and 13°C at night. You'll set off for Pernio on the 19th (Fri). Perniö is a former municipality of Finland. Spend the 20th (Sat) exploring nature at Teijo national park. There's still lots to do: contemplate the long history of Ruukin kehräämö ja puoti Oy. To find ratings, maps, where to stay, and tourist information, use the Pernio tour itinerary builder site . You can drive from Uusikaupunki to Pernio in 2.5 hours. In July in Pernio, expect temperatures between 25°C during the day and 13°C at night. You'll set off for home on the 26th (Fri).